He made the comment in a speech to U.S. servicemembers at MacDill Air Force Base in Tampa, Florida after receiving a briefing and eating lunch with troops. The president began talking about how “radical Islamic terrorists are determined to strike our homeland” as they did on 9/11, in the Boston bombings and in San Bernardino. He said it’s also happening “all over Europe” like in Paris and Nice. “It’s gotten to a point where it’s not even being reported. In many cases, the very, very dishonest press doesn’t want to report it. They have their reasons and you understand that,” Mr. Trump said. There is no evidence that any media outlet is covering up terrorist attacks. This comes after his adviser, Kellyanne Conway, referred to the “Bowling Green Massacre,” which never happened, in an effort to defend the administration’s travel ban. She later claimed that she misspoke and meant “Bowling Green terrorists.” Cosmopolitan said Monday that Conway had also referred to the fake massacre in an interview with one of its reporters. 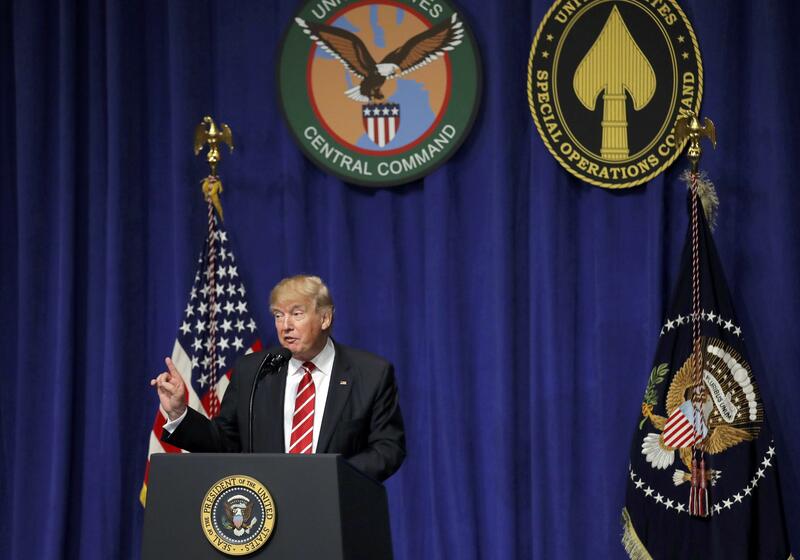 During the speech Monday, Mr. Trump vowed to defeat the Islamic State in Iraq and Syria (ISIS) and also repeated his call for members of NATO to contribute more to the alliance.